Trained in the Philippines by Filipino legend Grandmaster Ciriaco "Cacoy" Canete himself, 8th degree black belt Christopher Petrilli has distilled his knowledge of Japanese aikido, Indonesian silat and Filipino Doce Pares eskrima into an elevated system of stick fighting that goes far beyond anything previously captured on video. In Volume 1 of this unprecedented Paladin video series, Master Petrilli teaches you how to move from largo mano range instantly to the close-in fighting that characterizes Doce Pares eskrima. From there, he goes into sinawali patterns that show you how to strike and soften up your opponent, drawing him into the locking and throwing lines that will finish him off. Volume 2 teaches different lines that allow you to explosively disarm your opponent and effortlessly maneuver him into the arm bar position. 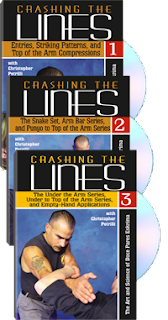 Then, proving that anything you can do with the stick end you can do with the punyo, Petrilli shows you how to perform the punishing locks, throws and chokes previously learned with just a few inches of stick. Volume 3 wraps up with several more locking and throwing lines, going from over the arm to under it. Finally, he takes the stick away, teaching you how to do the same techniques empty-handed to the same brutal effect. For information purposes only. A former U.S. Army Ranger, Christopher Petrilli is an 8th degree black belt in Doce Pares eskrima under the legendary Grandmaster Cacoy Cañete. He is also an expert practitioner of Indonesian pentjak silat and Japanese aikido.